In March 2004, The Royal Forestry Society hosted a Conference Better Trees, Better Profits, to promote genetic and silvicultural aspects of growing quality hardwoods, held at RASE Stoneleigh (Hemery and Savill, 2004). This highly successful Conference was followed up by a field visit in June to the Northmoor Trust’s Forestry Research Centre, where many of the points discussed could be viewed in practice in the numerous field trials. The Northmoor Trust (NMT) hosts one of the largest collections of forestry trials in the UK, promoting the principles of sustainable forestry through applied research and demonstration. The key objective of the Centre is to promote the role of the forestry industry within a sustainable countryside by developing genetically improved planting stock through selection and breeding, demonstrating the multiple benefits from managing woodlands in a sustainable fashion, and developing and promoting viable solutions for forestry and woodland in the face of environmental change. These were continual themes throughout the field day. The Northmoor Trust has received significant support for many of its trials from Woodland Heritage since the inception of its Forestry Research Centre (FRC) in 1992. The Northmoor Trust works with many partner organisations in the establishment of trials, most notably, Forest Research (FR) and East Malling Research (EMR), in conjunction with the British and Irish Hardwoods Improvement Programme (BIHIP). During the field day, many of the researchers from these organisations presented their work, and lively discussion followed. The tour started with a look at some mixed species planting. One mixture including Wild Cherry, Prunus avium, led to a lively debate about the species. It was explained that wild cherry exists in two forms, true wild cherry suitable for timber production and sweet cherry that has been bred for its low, heavy branching pattern, suitable for fruit production for jam. Until recently, much of our planting stock came from Europe with no assurance of quality and suitability for timber production in the UK. The main points raised here were that, at present, there is no assurance of the genetic quality of much of our planting stock, and that good silvicultural practice is always necessary to produce a valuable timber crop. Karen Russell presented the work of EMR in providing the industry with genuine wild cherry that is of good growth and habit, and possesses some resistance to bacterial canker. She explained that ten clones were released in 2000 under the trade name WildstarTM. Tree breeding is a key component of improving the quality of our hardwood resource. 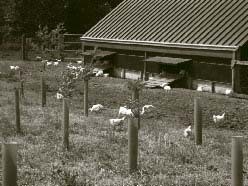 The ash breeding seedling orchard (BSO) was the first trial established at the FRC in 1993, in partnership with BIHIP. Based on 36 families selected across the UK and replicated at four sites, this trial is almost reaching its conclusion. A BSO combines the testing phase (the progeny trial) with the production stage (the seed orchard) to reduce the time needed to release tested, improved seed to the market. Provenance trials are a useful tool used to identify the best seed sources for production in the UK. The NMT hosts an ash and a beech provenance trial for FR. In this ash trial, European provenances showed greatest vigour, but British provenances showed better form. Ash from Yorkshire had better than average vigour, reasonable form and is already producing seed, whilst trees from Romania, although exhibiting greater vigour were of poor form. Much of our planting stock today comes from eastern Europe and is poorly adapted to growth in the UK, being frost sensitive and thus prone to forking. The international beech provenance trial, established in 1999, comprises 23 provenances from across the range of beech, and is replicated at many sites across Europe. There is increasing interest in beech in the light of climate change. Climate change models described by Mark Broadmeadow from FR predict a 3 - 5°C increase in summer temperatures, a decrease in summer rainfall and a 30% increase in winter rainfallin the south east by the end of this century, making flooding a serious possibility across Britain. Under these environmental conditions, it is likely that beech will become increasingly difficult to grow on a productive scale and new provenances need to be introduced to ensure the continuation of this species in to the next century. Work is being conducted to identify those provenances that will perform well in the British climate today and for the future. Walnut – for the future? In view of climate change, it is becoming increasingly evident that, as foresters, we need to consider not only alternative provenances for our native species, but also productive non-native species. An obvious choice is walnut, both common (Juglans regia) and black (J. nigra). Much work has been carried out by the NMT, investigating establishment techniques for walnut and on provenance selection. Walnut has traditionally been viewed as somewhat difficult to establish. Gabriel Hemery presented another of the Woodland Heritage funded trials, testing a novel way of growing walnut. This utilises a series of nitrogen-fixing trees and shrubs as nurse species to provide an ideal environment to promote walnut establishment. Early results show increased growth of walnut with excellent form. In conclusion, the day was a great success with over 70 delegates attending and contributing to the discussion. The Northmoor Trust are indebted toWoodland Heritage for their continued support, both for various experiments now established at the FRC and for promoting our common goal of a sustainable forestry industry for tomorrow. Woodland Heritage for their continued support, both for various experiments now established at the FRC and for promoting our common goal of a sustainable forestry industry for tomorrow. Hemery, G.E. and Savill, P.S., 2004. Better Trees, Better Profits. RFS Conference Report. Quarterly Journal of Forestry 98 No. 3.